Be sure to check if the following testing will interfere with your flight plans! 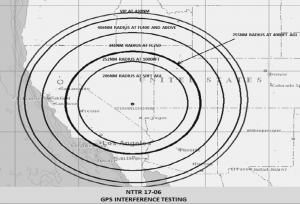 GPS Testing can interfere with the accuracy of the signal sometimes from ground level up to an unlimited altitude, and can extend well beyond the Navaid's site area! Also, You are asked to please report anomalies in accordance with the Aeronautical Information Manual (AIM) paragraphs 1-1-13 and 5-3-3. BE SURE TO CHECK NOTAMS for status and/or any changes! The AOPA Advocacy article dated 11/28/2018 entitled, Less isn't more for GPS and flight safety by Dan Namowitz describes the paradox created by GPS Interference testing (the degrading of the GPS signal) when at the same time the FAA world is promoting GPS / ADS-B technology as the Nextgen Standard. You can read AOPA's article addressing GPS Testing, that includes a reference to navigation circumstances created by GPS testing in the Los Angeles area by clicking HERE. GPS is vital to modern navigation, but if a satellite fails or there's a jamming attack, it quickly becomes useless. Scientists may have a much more robust answer. Scientists have demonstrated a "commercially viable" quantum accelerometer that may provide navigation without GPS or other satellite technology. The device uses lasers to cool atoms to extremely low temperatures, and then measures the quantum wave properties of those atoms as they respond to acceleration. It might keep transportation networks humming even if GPS fails outright. Read more here. You are reminded that UTC time is 8 hours ahead of PST & 7 hours ahead of PDT. Centered at 392534N1180515W or the MVA VOR 344 degree radial at 52NM.